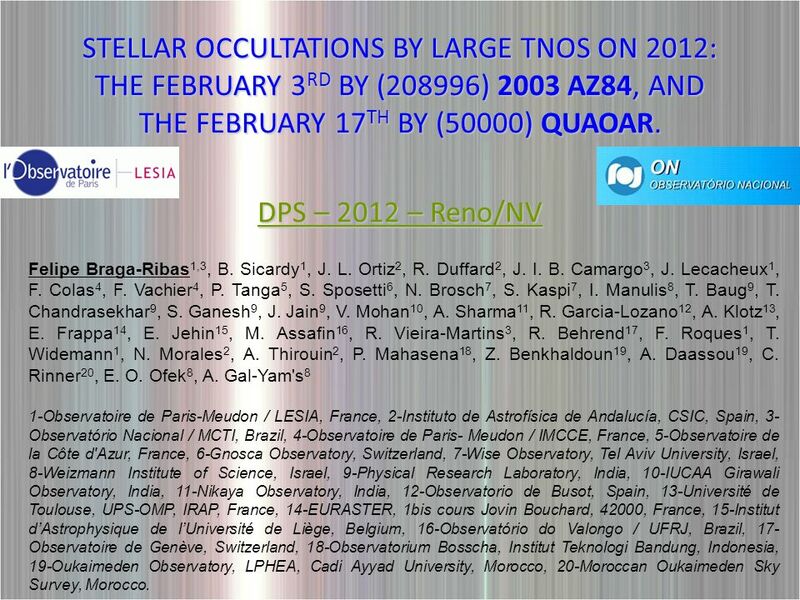 DPS – 2012 – Reno/NV STELLAR OCCULTATIONS BY LARGE TNOS ON 2012: THE FEBRUARY 3 RD BY (208996) 2003 AZ84, AND THE FEBRUARY 17 TH BY (50000) QUAOAR. Felipe. 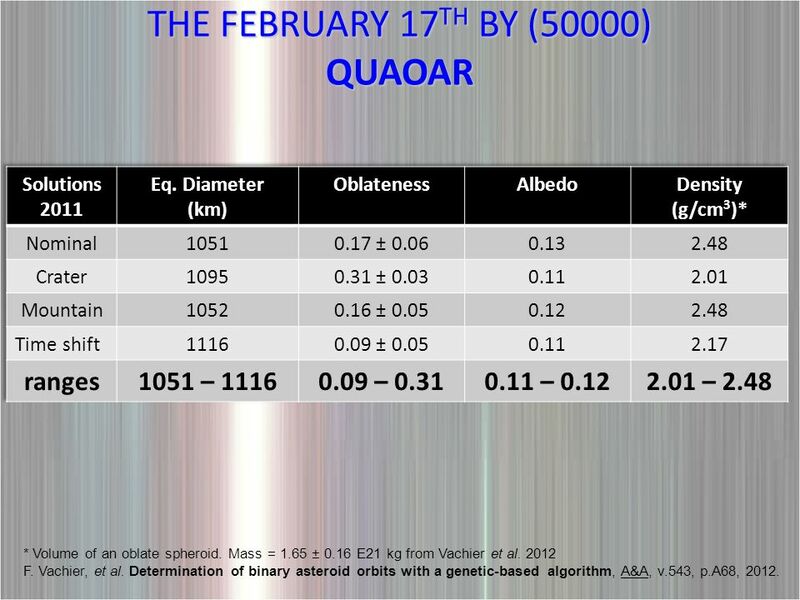 1 DPS – 2012 – Reno/NV STELLAR OCCULTATIONS BY LARGE TNOS ON 2012: THE FEBRUARY 3 RD BY (208996) 2003 AZ84, AND THE FEBRUARY 17 TH BY (50000) QUAOAR. Felipe Braga-Ribas 1,3, B. Sicardy 1, J. L. Ortiz 2, R. Duffard 2, J. I. B. Camargo 3, J. Lecacheux 1, F. Colas 4, F. Vachier 4, P. Tanga 5, S. Sposetti 6, N. Brosch 7, S. Kaspi 7, I. Manulis 8, T. Baug 9, T. Chandrasekhar 9, S. Ganesh 9, J. Jain 9, V. Mohan 10, A. Sharma 11, R. Garcia-Lozano 12, A. Klotz 13, E. Frappa 14, E. Jehin 15, M. Assafin 16, R. Vieira-Martins 3, R. Behrend 17, F. Roques 1, T. Widemann 1, N. Morales 2, A. Thirouin 2, P. Mahasena 18, Z. Benkhaldoun 19, A. Daassou 19, C. Rinner 20, E. O. Ofek 8, A. Gal-Yam's 8 1-Observatoire de Paris-Meudon / LESIA, France, 2-Instituto de Astrofísica de Andalucía, CSIC, Spain, 3- Observatório Nacional / MCTI, Brazil, 4-Observatoire de Paris- Meudon / IMCCE, France, 5-Observatoire de la Côte d'Azur, France, 6-Gnosca Observatory, Switzerland, 7-Wise Observatory, Tel Aviv University, Israel, 8-Weizmann Institute of Science, Israel, 9-Physical Research Laboratory, India, 10-IUCAA Girawali Observatory, India, 11-Nikaya Observatory, India, 12-Observatorio de Busot, Spain, 13-Université de Toulouse, UPS-OMP, IRAP, France, 14-EURASTER, 1bis cours Jovin Bouchard, 42000, France, 15-Institut dAstrophysique de lUniversité de Liège, Belgium, 16-Observatório do Valongo / UFRJ, Brazil, 17- Observatoire de Genève, Switzerland, 18-Observatorium Bosscha, Institut Teknologi Bandung, Indonesia, 19-Oukaimeden Observatory, LPHEA, Cadi Ayyad University, Morocco, 20-Moroccan Oukaimeden Sky Survey, Morocco. 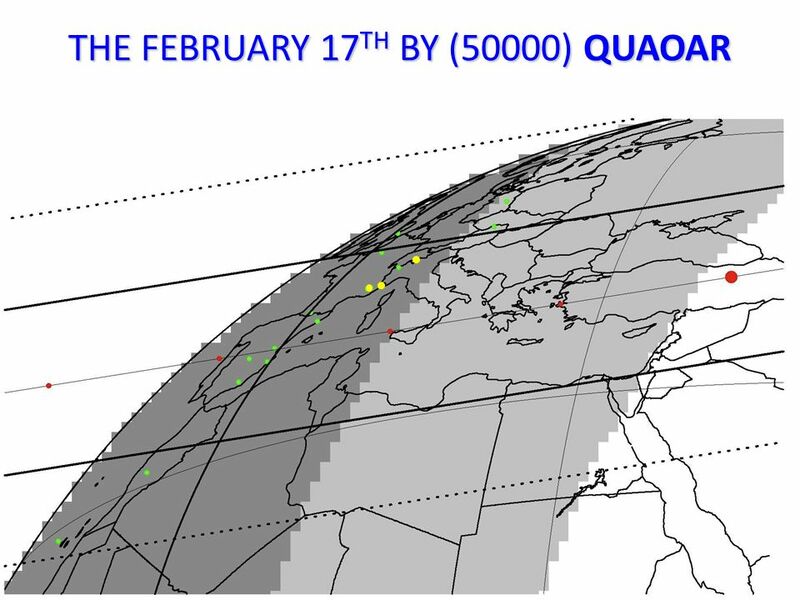 2 THE FEBRUARY 17 TH BY (50000) QUAOAR - Prediction from Assafin et al. 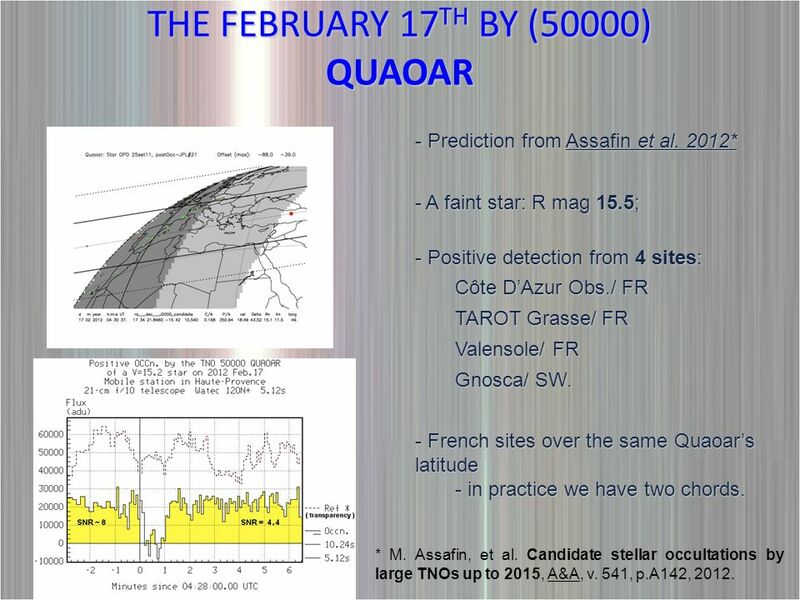 2012* - A faint star: R mag 15.5; - Positive detection from 4 sites: Côte DAzur Obs./ FR TAROT Grasse/ FR Valensole/ FR Gnosca/ SW. - French sites over the same Quaoars latitude - in practice we have two chords. 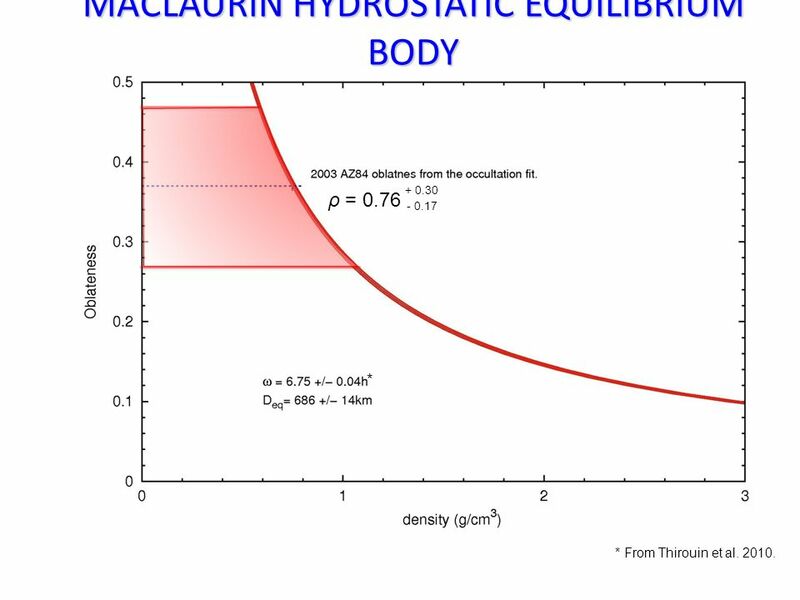 * M. Assafin, et al. 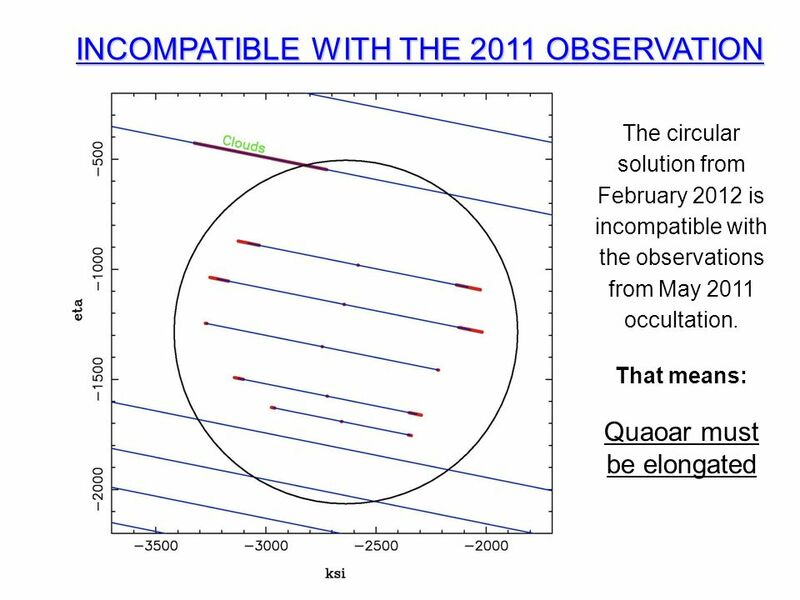 Candidate stellar occultations by large TNOs up to 2015, A&A, v. 541, p.A142, 2012. 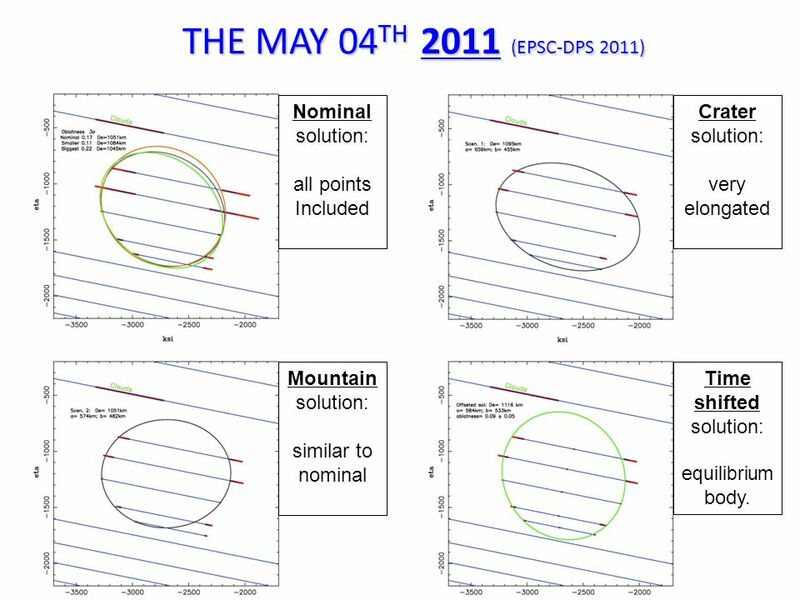 6 THE MAY 04 TH 2011 (EPSC-DPS 2011) Nominal solution: all points Included Crater solution: very elongated Mountain solution: similar to nominal Time shifted solution: equilibrium body. 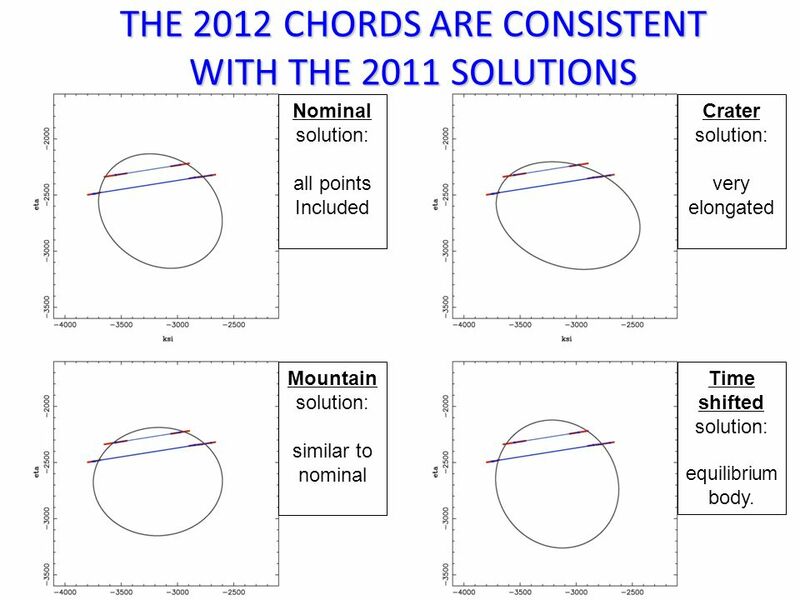 7 THE 2012 CHORDS ARE CONSISTENT WITH THE 2011 SOLUTIONS Nominal solution: all points Included Crater solution: very elongated Mountain solution: similar to nominal Time shifted solution: equilibrium body. 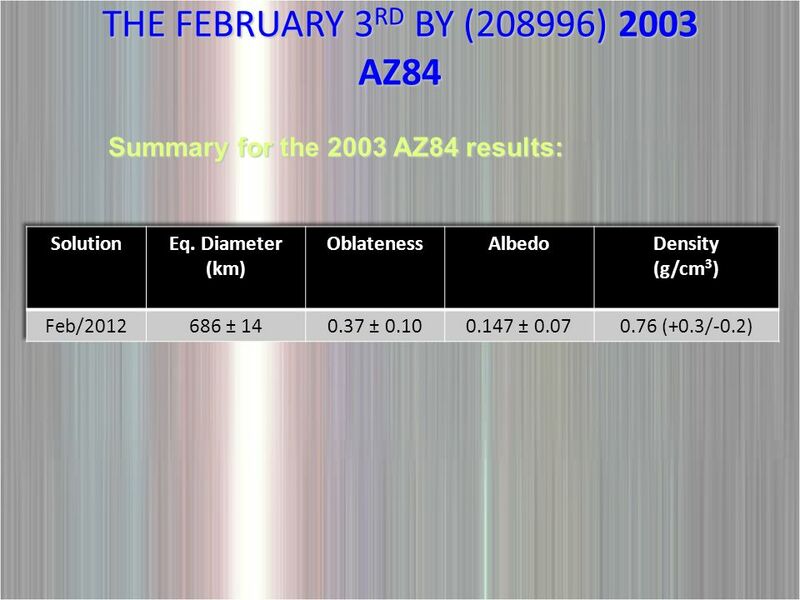 10 THE FEBRUARY 3 RD BY (208996) 2003 AZ84 - Prediction from Assafin et al. 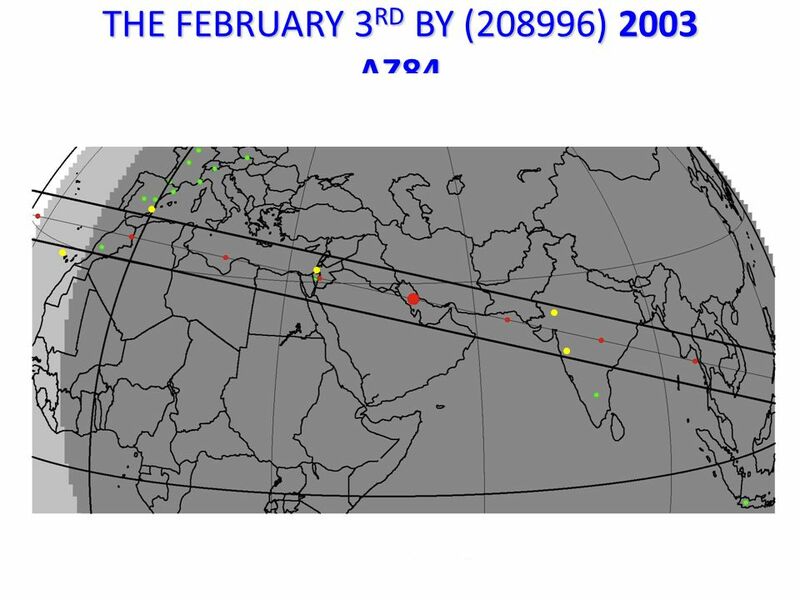 2012 - A faint star: R mag 15.1; - Positive detection from 3 sites: Mount Abu Observatory/ India Weizmann Inst. 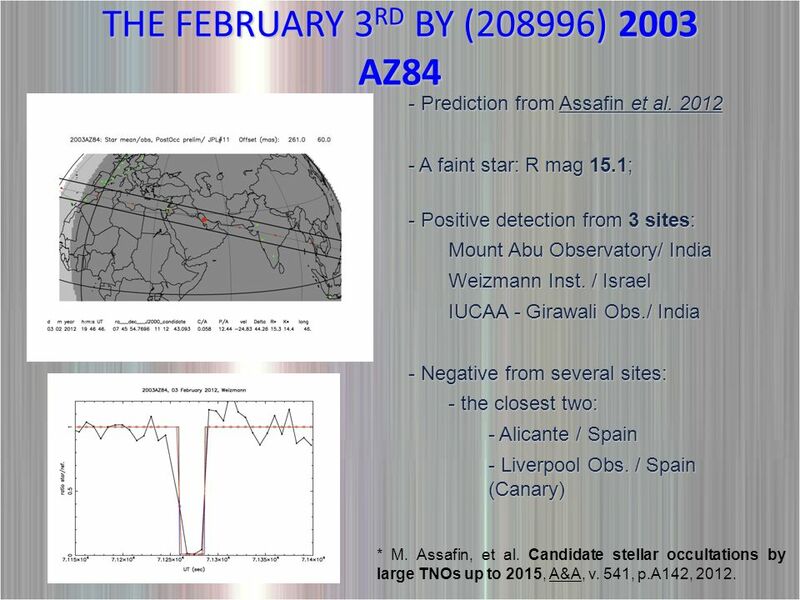 / Israel IUCAA - Girawali Obs./ India - Negative from several sites: - the closest two: - Alicante / Spain - Liverpool Obs. 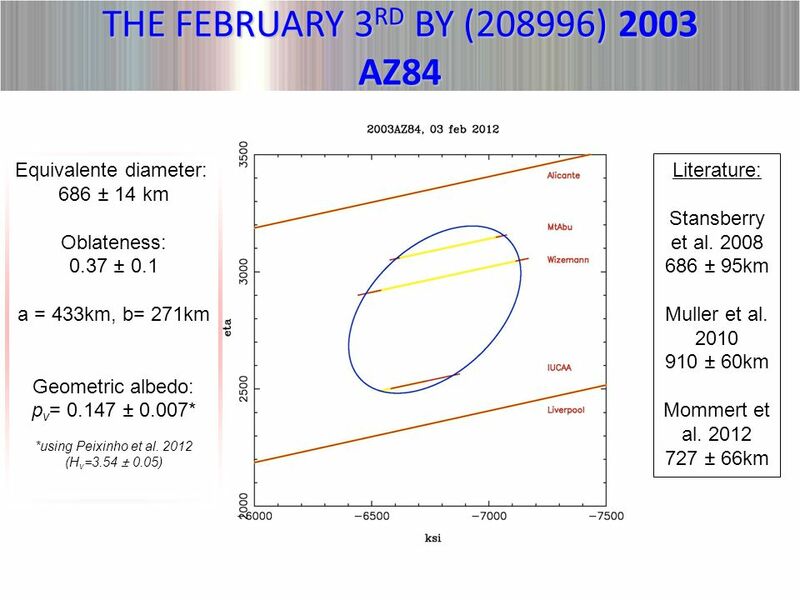 / Spain (Canary) * M. Assafin, et al. 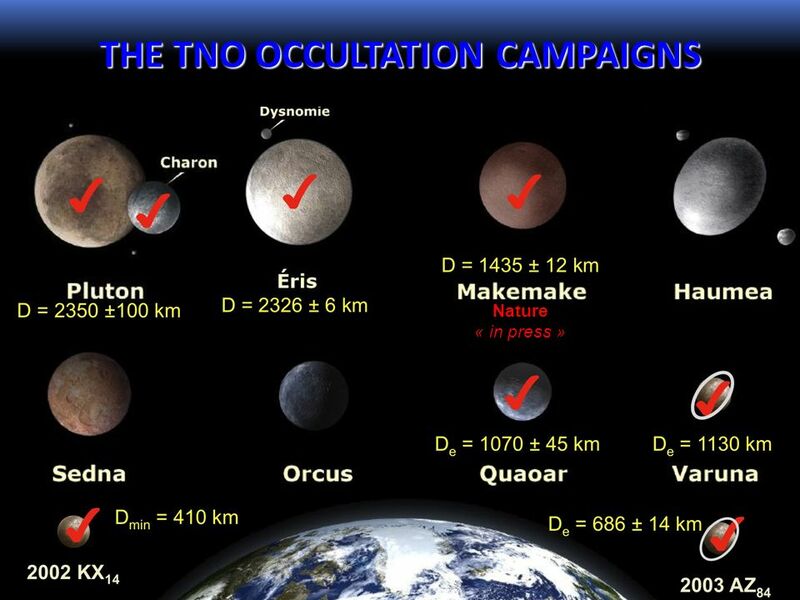 Candidate stellar occultations by large TNOs up to 2015, A&A, v. 541, p.A142, 2012. 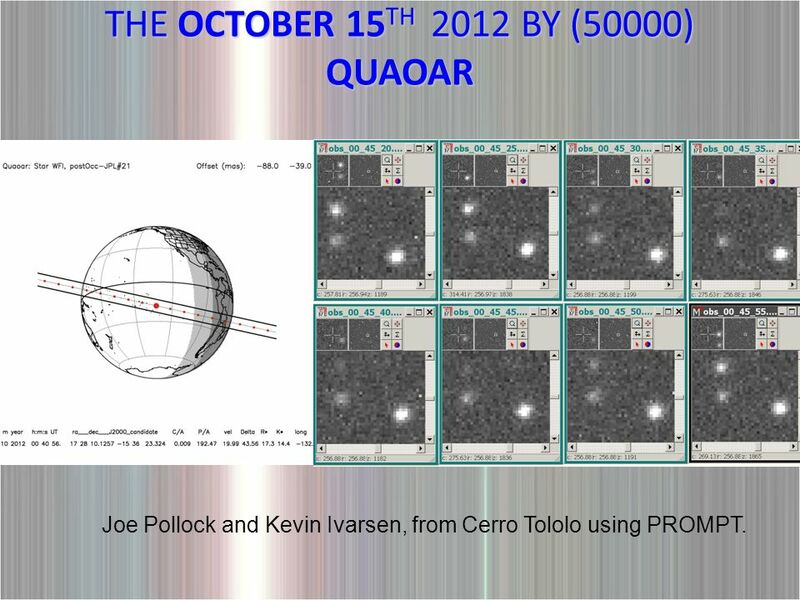 15 THE OCTOBER 15 TH 2012 BY (50000) QUAOAR Joe Pollock and Kevin Ivarsen, from Cerro Tololo using PROMPT. 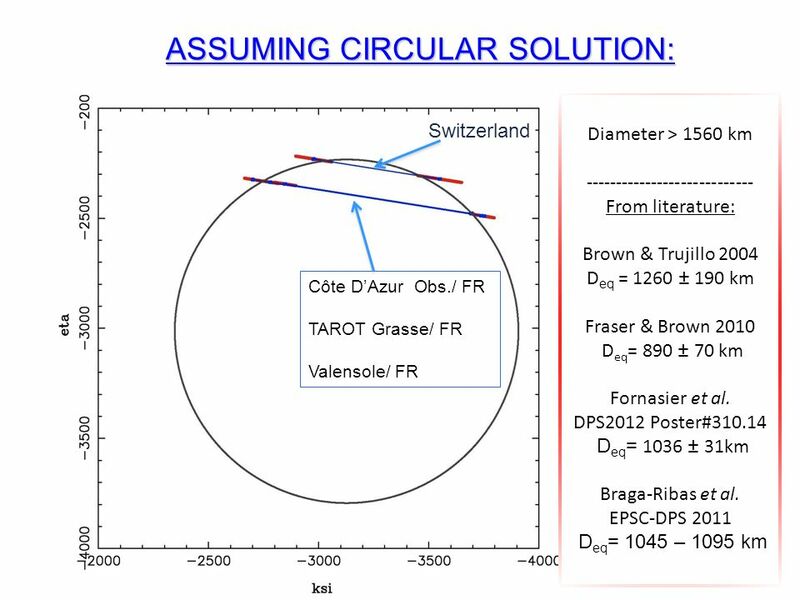 Download ppt "DPS – 2012 – Reno/NV STELLAR OCCULTATIONS BY LARGE TNOS ON 2012: THE FEBRUARY 3 RD BY (208996) 2003 AZ84, AND THE FEBRUARY 17 TH BY (50000) QUAOAR. Felipe." 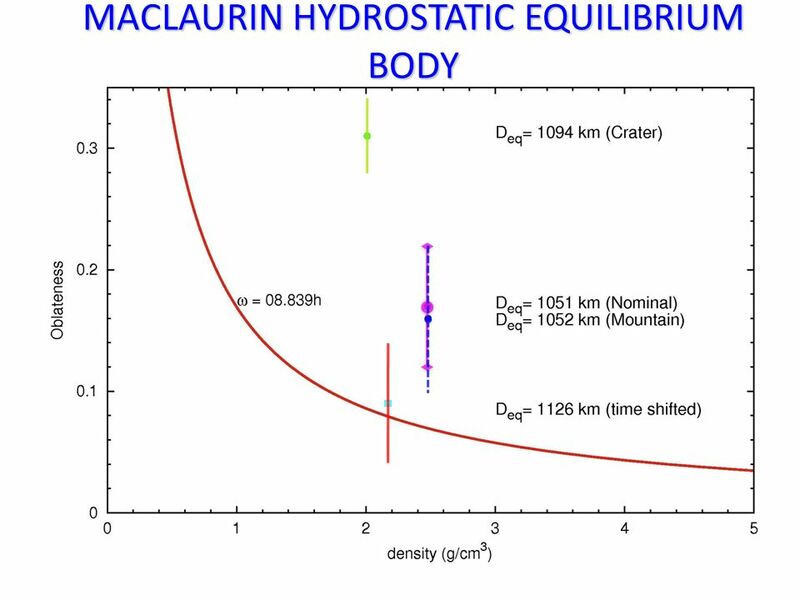 POLARIMETRIC OBSERVATIONS OF TNOs AND CENTAURS AT THE ESO-VLT Institute of Astronomy, Kharkiv National University, Ukraine Irina Belskaya In collaboration.